Learn time-saving techniques and tested production-ready tips for maximum speed and efficiency in creating professional-level architectural visualizations in 3ds Max. Move from intermediate to an advanced level with specific and comprehensive instruction with this collaboration from nine different authors from around the world. Get their experience and skills in this full-color book, which not only teaches more advanced features, but also demonstrates the practical applications of those features to get readers ready for a real production environment. 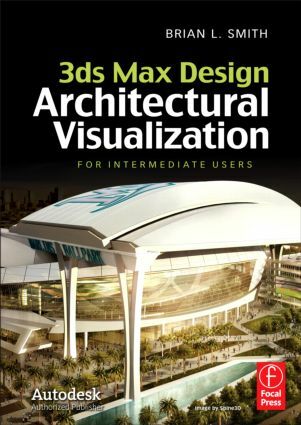 Fully updated for the most recent version of 3ds Max. Brian L. Smith has worked since 1997 as a CAD manager and animation specialist in architectural, engineering, and landscaping firms. Since 2001, he has led his own company specializing in the production of architectural animations and renderings in 3ds max. He is the cofounder of 3DAS and CGschool, where he teaches. Brian is also an active-duty member of the armed forces.